According to newly released Harvard study, Americans ages 18-29 are losing trust in government. Since just 2010, trust in major government institutions declined by 8 percent among Americans ages 18-29. Not one major government institution in the poll achieved a level of trust of 50 percent or above. The poll revealed more than just a general mistrust in government among American youth. Americans ages 18-29 increasingly believe elected officials don’t have their interests in mind; young Americans also feel they have increasingly less ability to change what government does. These statistics may not shock the average Illinoisan, considering only 28 percent of residents in the state trust their government. But the trend should grab political leaders’ attention. America’s youth are frustrated with government institutions and elected officials, and they’re turning away from the parties with which they traditionally identify. According to the same study, a group that many assume are solidly part of President Barack Obama’s base now identifies as politically “independent” the majority of the time. The number of American youth identifying with Democrats and Independents has flip-flopped in the past several years. Since 2010, Americans ages 18-24 identify more frequently as being independent rather than Democrat – 40 percent (I) – 35 percent (D). 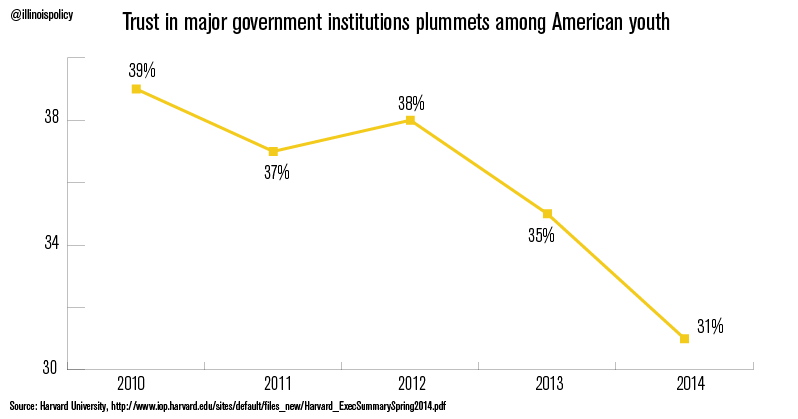 It’s clear: Trust in government and elected officials has eroded since 2010. Young Americans are frustrated and looking for solution outside the bounds of traditional party affiliation. They just want something that works – and bigger government doesn’t seem to be it.